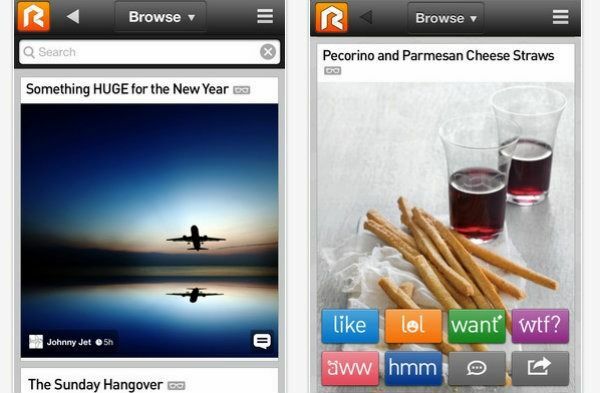 Rockmelt, the social web browser, is continuing its effort to rethink the mobile browsing experience with a new app for iPhone. The app, which launched on Thursday, combines a traditional web browser with a social news reader. In addition to letting you search for a particular keyword or URL, the app also populates the main page with articles from your favorite publications or shared by other users that you follow. This way, even if you never search for something on the web, the web will still come to you. Rockmelt first introduced this functionality with its iPad app that came out in October. The main goal for both the iPhone and iPad app, according to the company’s CEO Eric Vishria, is to create a more dynamic browsing experience for mobile that isn’t just a carbon copy of the desktop browsing experience. “What people have done on the mobile side is build a sad and boring translation of what has been done on the desktop,” he said. There’s also a more fundamental goal for Rockmelt as a company. It wants to remake itself as a mobile-first product.